↑ Kurtzman, C.P., Fell, J.W. 2006. "Yeast Systematics and Phylogeny — Implications of Molecular Identification Methods for Studies in Ecology. 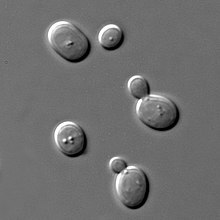 ", Biodiversity and Ecophysiology of Yeasts, The Yeast Handbook, Springer. Retrieved January 7 2007.